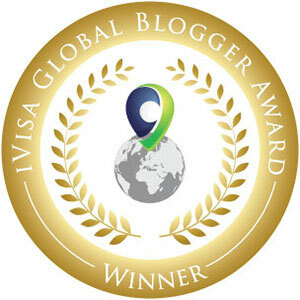 It's so fantastic to be asked by both the publishing companies and authors to host so many blog tours at the moment. However, today's great post is by the brilliant author Caroline Lawrence, who is particularly well-known for her popular Roman Mysteries. Caroline is promoting her new series which is centred around a wild western detective theme. This story will have your heart in your mouth almost around ever corner and every page that you read. I would like to both welcome and thank Caroline for writing such a great post. I have to say that I particularly like the first book cover option due to its appealing quality and the great use of colour. Thanks to Nina at Orion for organising this blog tour. I hope you all have a great weekend. My new series is called the Western Mysteries, but its just as much an historical novel as a Western. In other words, my fictional characters interact with real people in a real place at a specific time. My real place is Virginia City, Nevada Territory and my real time is September 1862. Think Dickens in Deadwood. Or the Famous Five as Forty-niners. This rough and ready mining town exploded into existence with the discovery of silver veins deep in the mountain. All the buildings youd associate with a Western town came into existence; first in canvas, then wood, finally brick. Virginia City still exists, and has kept a lot of its character. You can still visit a dozen saloons, the fire station, the courthouse and jail, even a big old music hall. And archaeologists have even done an excavation on the site of one of the saloons. They found fascinating artefacts like spittoons, beer bottles, oyster shells, coins, buttons and bullet casings. This was a read frontier town where almost everybody carried a firearm. Somebody, maybe Mark Twain, said that at night you could read by the light of gunfire. So how to devise a cover that reflects the gritty, menacing, blackly funny world portrayed in my books? My first idea was to design a cover based on one of the old Dime Novels much beloved in the American West? Like a Dime Novel our cover could show an exciting scene from the first few chapters. My hero, a 12-year-old named P.K. 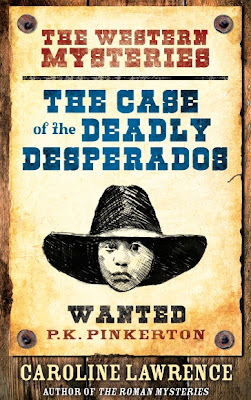 Pinkerton, has found his parents scalped and murdered by desperados disguised as Indians. He has to get out of town fast, so he leaps onto a passing stagecoach, scrambles up on top and makes himself as flat as a postage stamp. My publishers and I thought this would be a great scene for the cover, as it is exciting and comes early in the story. We referenced real stagecoaches as well as scenes from Red Dead Redemption and came up with this. This cover (above) is exciting, but it doesnt quite convey danger and menace of the story. Or the deadpan humour. Or its grittiness. We were also worried that it might seem too babyish. With drinking, smoking, gambling and gunplay, this book is definitely not babyish. One of the things I love most about writing historical fiction is the research, getting the details of the culture right and especially the artefacts. So I considered putting some of the guns on the cover. Maybe a spittoon and playing cards, too. Then I had the idea of using a document of the time: a deed for a silver mine. A newspaper front page. Or a WANTED poster! The WANTED poster format seemed perfect; straightaway it says Western and outlaws. My husband and I created an image for P.K.s face by using the photo of a Native American child, then stretching it to make him (or her?) look older, then ramping up the contrast, then adding a period hat, then drawing it. I did the first four steps and my husband Richard did the drawing. 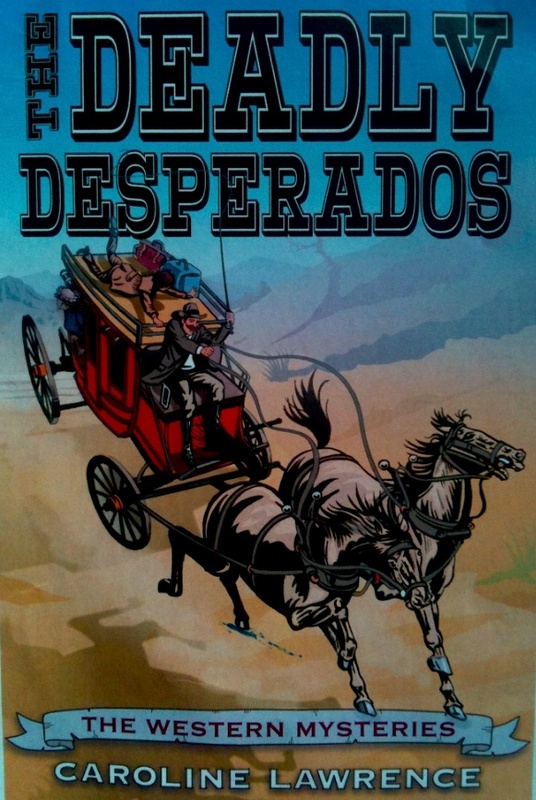 The solemnity of the childs face tones down the jaunty alliterative title Deadly Desperados. The sun bleached colours and distinctive typeface suggest a specific time and place. And the word WANTED is both a subliminal suggestion and a tantalizing hook. Does it work? The folk over at Fixabook like it. But as for kids and their parents, only time will tell. 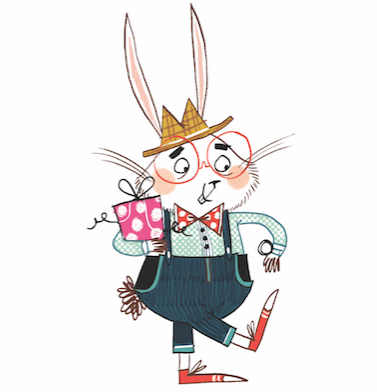 And Ive just heard that my American publishers have independently come up with the idea of P.K. clinging to the top of the stagecoach, but from a slightly different angle. Watch this space. I definitely prefer the one you chose finally. The other one reminds me of old Western paperbacks.